What are you doing on August 21, 2017? If you're looking for something extraordinary to do, come and enjoy the solar eclipse in Big Sky, Montana. Solar eclipses are quite rare. They occur when the Moon passes between the Earth and Sun. As the moon completely blocks out the sun, a massive shadow will be cast across the planet. It's absolutely wild to see. In fact this natural phenomena may be a once in a lifetime opportunity. The last time the path of totality of a solar eclipse passed through part of the United States was February 26, 1979. It's been 99 years since a solar eclipse went coast to coast across the US. Luckily, this jaw dropping astronomical event will occur this summer! Take advantage of this opportunity by booking a trip to Big Sky to see the solar eclipse. The August 21 solar eclipse is being called the Great American Total Solar Eclipse. This solar eclipse will sweep across the sky from Oregon to South Carolina. If you're in the roughly 70-mile wide path of totality, you'll experience a total solar eclipse for just over 2 minutes. Even if you're not in the exact path, everyone in the United States will experience at least a partial eclipse. Big Sky, Montana is just north of the path of totality. When you plan to view the solar eclipse in Big Sky, NASA.gov says you'll be able to see 96.66% coverage. Mark your calendars and clear your schedule because the natural event starts at 10:17 am and ends at 12:58 pm with the max at 11:35 am. 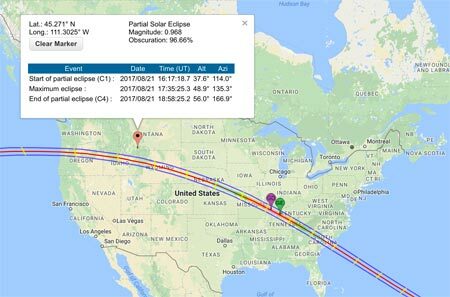 Check out this video animation of the solar eclipse in Big Sky from TimeAndDate.com or look at this interactive map from NASA.gov for more detailed information. 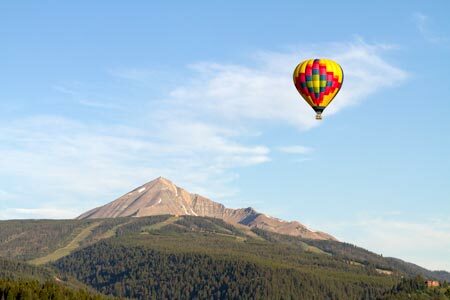 If you're planning your vacation around the August 21, 2017 solar eclipse, Big Sky is a prime destination. Our mountain town is the perfect place to set up shop and enjoy the solar eclipse along with all sorts of other outdoor and cultural activities. With limited light pollution, clear skies, and few people, Big Sky is the ideal place to sit back, relax, and view the power of Mother Nature as the Earth, Moon, and Sun align. If you want to view the solar eclipse in the path of totality, you're just a short drive away. Why not base yourself in Big Sky and then go on a solar eclipse and national park road trip? Regardless of whether you watch the eclipse from Big Sky or you venture a bit off the beaten track, Big Sky is the perfect place to get away from it all and embrace the beauty of nature. If you are in the Greater Yellowstone Ecosystem for this natural phenomena remember to book your campsite or hotel ASAP to ensure you get a spot. We guarantee people will be traveling from near and far to witness the Great American Total Solar Eclipse. This event is going to be extraordinary. Wherever you choose to view the August 21 solar eclipse from, we know you'll enjoy it. Please plan ahead so that you have a pair of special solar eclipse glasses to protect your eyes. Safety first. Learn more about the August 21, 2017 solar eclipse from Space.com, GreatAmericanEclipse.com, and Eclipse2017.NASA.gov. We hope to see you in Big Sky, Montana for the August 21 Solar Eclipse!